From what I can find, there are no large studies on the matter. However, there have been several small studies that are very supportive of St. John’s wort and breastfeeding. One set of studies offers no reports of any adverse effects on the nursing infant. While another study states the need for larger safety data, it also suggests that standardized St. John’s wort extracts may prove a safe alternative to SSRIs for postpartum depression. The dosage used in the study was 300 mg of standardized St. John’s wort. Most regular depression protocols for St. John’s wort recommend 300 mg three times per day. Take a product that is standardized, preferably organic, and from an excellent company that is GMP certified. 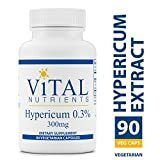 I recommend Source Naturals St. John’s Wort Extract or Vital Nutrients Hypericum Extract. If you are not breastfeeding, you can start with 300 mg dose once per day for a few days, then increase to two per day until you reach three 300 mg capsules per day. Some women take up to two weeks to notice a difference, but others feel a change immediately. Master herbalist Susun Weed recommends using St. John’s wort tincture to minimize all potential side effects. This form of the herb also allows you to increase your dosage easily. I recommend Herb Pharm St. John’s Wort Extract. Though it is unlikely, if your baby gets unusual symptoms like becoming colicky or drowsy, then stop entirely. It may be that the herb increases the letdown reflex of the breast milk, and the baby can have trouble adjusting. Alternatively, the baby may be particularly sensitive to the herb. Although babies go through lots of changes in their bodies all the time, it’s important to be safe. When breastfeeding, it’s best to start any herbal supplement gradually. Find the lowest dose that you feel benefits from. Even a small dosage over months as a part of a larger regimen may be very beneficial to you. St. John’s wort is a very important herb for alleviating the symptoms of depression, and specifically postpartum depression, but don’t rely on it alone. It won’t restore the lost nutrients you may be needing, or heal any hormone imbalance issues. Nor will it address any feelings of isolation or stress you may be experiencing. Postpartum depression is complex and you, wonderful mom, deserve lots of support! Do consult your physician and a lactation consultant for more information. Do NOT use St. John’s wort if you are currently taking prescription antidepressants, the birth control pill, or are sensitive to the sun. St. John’s wort is not recommended for severe depression.